I'm sure we've used this blog post title before. Top Top is running tomorrow at Lingfield (3:00). This son of Frankel is trained by Ralph Beckett in the ownership of King Power Racing Co Ltd. The mare, Jira, won twice in her career, achieving Listed-class success. Top Top wasn't fancied in the betting when a 33/1 shot. 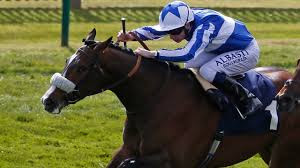 He ran over one mile at Newmarket, almost ten lengths behind Turgenev who is top class. This 260,000 guineas yearling purchase needs to have improved for that first outing. That is likely. Interesting to see how he goes after well over a month on the sidelines.